When I was a kid, a favorite snack was fettuccine alfredo carbonara, a gloppy, creamy confection with little bits of (probably fake) bacon and parsley. It came in a pouch of dried noodles and powder, which I cooked on the stove with milk and butter (or rather margarine probably). Hey...it was the early '90s and I was like 15. It's not something I would make today, although I still feel the lure of noodles, cream, cheese and bacon. 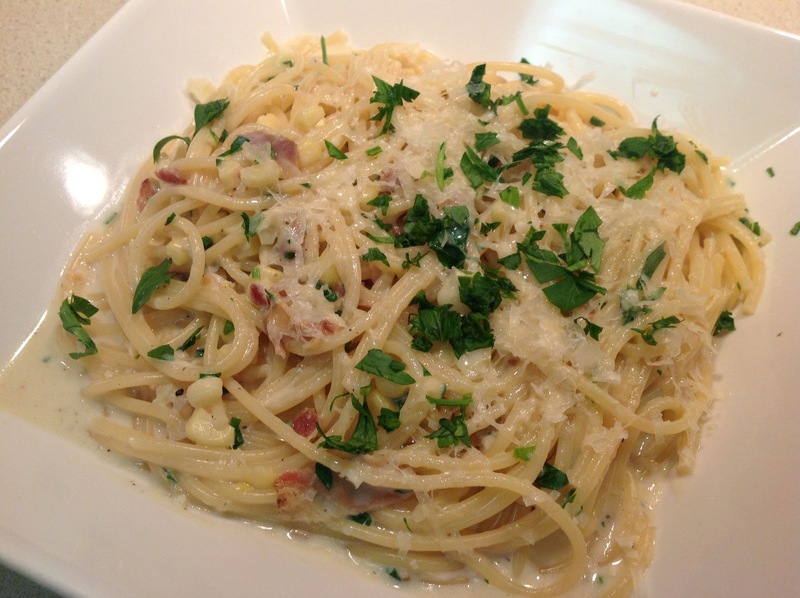 Mmm... Alfredo carbonara doesn't come without some costs though. First off, alfredo sauce is basically cream (despite the fact that originally it was only cheese). And carbonara is prepared with raw egg that "cooks" with the heat of the pasta. Yeah right. There's no way just boiled pasta is going to raise raw eggs' temperature to 165 F.
For my pasta dish I set out with three aims: 1) eliminate the cream to lighten the dish but still have a creamy sauce, 2) keep the richness of the eggs but cook them, and 3) take advantage of this year's good crop of fresh sweet corn while it's still around. Adding a little vermouth just before removing the corn from the pan helps remove much of the cooked on bits, which include a lot of good flavor. To achieve the first goal, I decided to approach the sauce like I would if I was making macaroni & cheese: make a bechamel sauce but with less flour so that it would thicken but not too much. My hope was that this would result in a creamy sauce, even if I used skim milk. 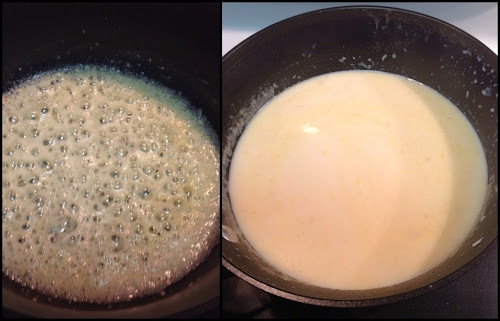 For the second goal, I decided my technique would be to treat my prepared béchamel a bit like the custard for making ice cream: temper a couple of egg yolks with warm liquid, stir it into the sauce and then cook the mixture gently until it reached an internal temperature of 165 F, at which point the egg is cooked but not at all curdled. Goal three was easy: just add some fresh corn into the mix. Making the sauce like a béchamel turned out rather well. It was a bit thin when the dish was finished, but as it sat out a bit it thickened up nicely. This suggests the pasta might be even better on the second day. I used plenty of garlic in the sauce and added some lemon zest for a bit of tang. The tempering of the egg worked out well too. Be sure to let the bechamel cool a bit before adding the egg, otherwise the egg will coagulate rather than mix in. And the corn was a great addition that went well with the pancetta and parsley. 1. Heat a large pot of salted water to boil. Cook pasta according to package directions for al dente. Drain and set aside. 2. Heat a large dry frying pan over medium heat. 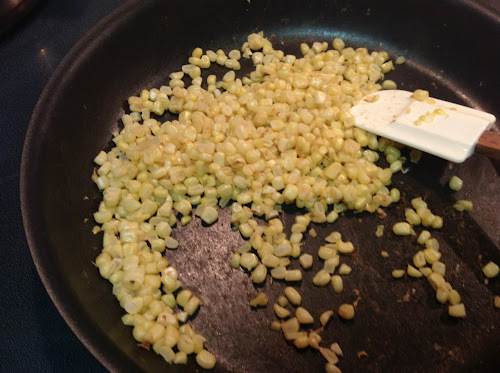 Add the corn kernels and cook about 10 minutes until they soften and start to brown. Just before removing from the pan, deglaze the browned bits with the vermouth. Remove the corn from the pan. 3. In the same large frying pan, cook pancetta until crispy over medium heat. Set cooked pancetta on paper towels to cool then chop into 1/2-inch size bits. 4. In a medium saucepan over medium heat, melt butter and sauté minced garlic. After a couple minutes, add flour and whisk, continuing to cook until the garlic starts to brown. Add milk to mixture, whisking constantly. Season with salt and pepper. Increase heat until the mixture starts to bubble and thicken, then remove from heat and cool for about 5 minutes. 5. Add the egg yolks to a small bowl and whisk together lightly. Add about 1 cup of the milk mixture to the egg yolks, whisking to combine, then pour the mixture into the saucepan with the rest of the milk. Heat over medium heat, whisking constantly, until it reaches a temperature of 165 F. Stir in 3/4 cup of the shredded parmesan, chopped pancetta and half of the chopped parsley. Pour sauce over cooked pasta. Serve in bowls topped with additional shredded parmesan and chopped parsley. This was really good! "Cornbonara" -- cute!